Have you ever looked at your dog sleeping and envy how easily he nods off? Most people have some periodic difficulty falling asleep and staying asleep. Narcolepsy represents a disorder that produces just the opposite condition. And it affects dogs as well as humans! According to the NIH National Institute of Neurologic Disorders and Stroke, narcolepsy is a chronic brain disorder that involves poor control of sleep-wake cycles. In humans, narcolepsy can greatly affect daily activities. People may unwillingly fall asleep while at work or at school, when having a conversation, playing a game, eating a meal, or, most dangerously, when driving or operating other types of machinery. I have seen both a dog and a person affected by narcolepsy and it is literally like a switch is being turned on or off. In dogs, while the daily implications are less life threatening, the symptoms are just as dramatic and the impact on daily life can be significant. A dog may be going about his normal activity or even running when suddenly he will lie down, almost fall down, asleep. The episodes are generally brief in humans and dogs but are nonetheless incapacitating and shocking to see. Though most veterinarians have not seen the condition and few owners have ever heard of it, the condition is not uncommon among dogs, especially Labrador retrievers, poodles, dachshunds and Doberman pinschers. This would imply some hereditary component to the condition. Stanford University1 gathered a group of affected dogs to ultimately prove a genetic cause, they traced it to a single gene that interfered with a chemical in the brain called hypocretin. Your veterinarian will perform a group of routine blood and urine tests to rule out conditions that could be confused with narcolepsy. A confirmation of the diagnosis may involve a referral to a veterinary neurologist. If at all possible try to video record an episode. This may help greatly in the diagnosis. Since the episodes themselves are relatively harmless, treatment is reserved for dogs with repeated attacks that interfere with their lifestyle. 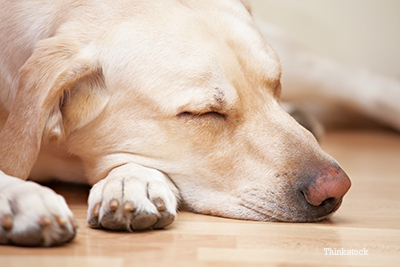 Treatment of dogs with narcolepsy involves oral administration of tricyclic antidepressants. These drugs block cellular uptake of norepinephrine, and are quite effective at managing the periodic paralysis that typically occurs in dogs with narcolepsy. Oral stimulants can be used to manage daytime sleepiness. Narcolepsy and associated signs are not life threatening. While there is no cure, most symptoms can be minimized. Because of the inherited basis for the condition, affected dogs should not be bred. Thanks to the dogs tested at Stanford University, the mystery of narcolepsy has been lifted since it was first described in the 1880's1. 1. "Dogs That Lay Down on the Job Helps Researchers." NIH Office of Science Education.